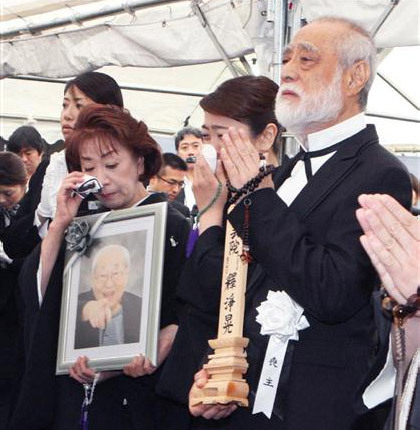 Many veterans of the Japanese entertainment world turned out yesterday for the funeral of actor Nagato Hiroyuki, who was 77 when he passed away Saturday. The funeral was held at the Azabuyama hall of the Zenpukuji temple in Moto-Azabu, central Tokyo. The “moshu” (chief mourner) was his younger brother, actor Tsugawa Masahiko (71), who revealed that he himself had been at death’s door on the same day. Having suffered a suspected heart attack, he was undergoing tests at the intensive care unit of a Tokyo hospital when he learned that his brother was being treated nearby for a gastrointestinal hemorrhage. Due to his condition, doctors refused to allow him to see his brother before he died. Nagato never quite recovered following the October 2009 death of his wife, actress Minamida Yoko. He cared for her during her final few years as she battled with dementia. The two were among the “royalty” of the Japanese movie world, huge stars in the 1950s and 60’s.